Hard water can cause build-up on surfaces, make it difficult to get dishes and silverware clean and affect the life of your appliances. A Whirlpool water softener is both an effective and affordable solution that can help manage these issues. Here’s how it works, and what users think about the product. What Is a Whirlpool Water Softener? How Do Whirlpool Water Softeners Work? Hard water is a common issue that can lead to large problems if left unaddressed. If you have a high percentage of minerals in your water supply, you’ll notice build-up on your faucets, sink, and inside appliances like your dishwasher over time. It can also make your laundry feel dry or scratchy, and cause you to use more soap or shampoo to work up a good lather in the shower. If you don’t install a softener system, you may find that you have issues with appliances that use water, and they may wear out quickly or need expensive repairs to fix the problems associated with mineral build-up. The simplest way to fix the problem is to purchase and install a water softener system in your home. If you’re looking for a well-known brand name with an excellent reputation for both quality and service, a Whirlpool water softener might be the right fit for you. In this article, we’ll look at the options the brand has to offer. You’ll learn how they work, which are the most popular models, and what the system will cost to install. Whirlpool is one of the largest and most popular water softener brands in the industry, and they make several models to fit the needs of nearly every home or commercial property. These devices take tap water and run it through a purification system that removes the minerals that cause hardness, and then pump the water back into your home for use. The one that’s right for you will have an appropriate usage capacity and the correct regeneration cycle to ensure you always have softened water when you need it. To determine which model will fit your needs, first, you need to understand how all Whirlpool water softeners work. Next, we will give you a step-by-step breakdown of the process. Although all Whirlpool models are salt-based softeners, it’s not actually the salt that does the purifying. Rather, it is thousands of resin beads that are inside of the water tank that remove chemicals that cause hard water. The salt is then used to clean those tiny beads during what’s called a regeneration cycle. This allows the system to automatically refresh and provide continual removal of the substances to keep your water soft. Here’s a step-by-step breakdown of how a Whirlpool water softener operates. First, hard water comes into your home via your water supply, either a water pipe or your well. It travels through your pipes and into your water softener. The tiny resin beads inside of the tank act like magnets to attract the minerals in your hard water, and they hold and extract them from the liquid. Once the process is complete, the water then flows through the tank and out into the plumbing throughout your entire home. This soft water is available to drink, shower, do laundry, and at any other location where you have a faucet. After the process is complete, your system will need to undergo regeneration. During the softening process, the sodium that coats the resin beads is swapped out for the hard minerals. Over time, those minerals will need to be cleansed and the salt levels recharged so that everything continues to function correctly. That’s why you’ll need to add salt to your system regularly. First, a brine solution which is made up of salt and water gets added to the softener. As this salty mixture flows into the resin tank, it will rinse off the minerals that have built up around the beads and replace them with new sodium stores. The minerals dissolve into the brine solution, and the system automatically flushes them out through a drain. Then, the resin beads are ready to go and soften water until another regeneration cycle is needed. Every Whirlpool model is equipped with their patented Demand Initiated Regeneration with Salt Saving Technology, which means it will only begin the process on an as-needed basis. This saves on expenses of both salt and water and also ensures that your system will never go too long between cycles. On average, the regeneration process takes about two hours, and during that time you won’t have access to soft water. There are several advantages to purchasing a product manufactured by Whirlpool. Here are some of the unique features and benefits to consider. Whirlpool offers water softeners in a variety of grain capacities, which makes it possible to find one that will accommodate your needs precisely. The grain capacity is a number that tells you the maximum number of grains of water hardness that the unit will remove before it needs to undergo a regeneration cycle. Generally, the higher the capacity, the longer you’ll go between cycles. However, the hardness of your water is also a significant factor in determining what level is best for your home. Measured in grains per gallon, or gpg, water hardness is something you can identify with an inexpensive test kit or by calling your local municipality. It’s measured in either milligram, parts per million, or liters and one grain of hardness is the equivalent of 1/ 7,000 of a pound of rock. That means that if you have one grain per gallon, it’s equal to 17.1 parts per million of water hardness. To calculate what size water softener is appropriate for your home, you’ll need to do some quick math. Take your gpg total and multiply it by the number of people who live in your home. Next, multiply that total by the number of gallons each person uses per day (80 is the average for most people). That total will help you determine what size tank you need. As one of the industry giants, Whirlpool is constantly innovating and developing products that are energy efficient. This cuts down not only on the cost of the supplies to maintain the unit but also on electricity and water consumption too. New technologies, like Wi-Fi compatibility, make it easy to manage and maintain your system. Although some competitors offer some of these features, Whirlpool water softener models all have several capabilities that allow you to sync them to your smart home and access your data while traveling or managing an off-site property. All Whirlpool devices are NSF certified and inspected by a third-party to ensure quality and capability. In addition, the company is well-known for offering robust, full-coverage warranties and excellent customer service both during and after purchasing their products. The cost of a new water softener will vary depending on the grain capacity you choose. In general, the higher the count, the more expensive it will be. Whirlpool has two lines of softeners, their traditional models and Pro Series. The Pro series are more pricey, but also include longer warranties and complimentary installation if you purchase them from Lowes. For example, the Whirlpool 33,000-Grain Water Softener retails for $661, but you will need to install the product yourself. It comes with both an installation manual and online support to help you through the process. On the other end of the spectrum, their high-end Whirlpool Pro Series High Capacity 60000-Grain Water Softener costs $1,197 but comes with installation from a local professional and the option to purchase an extended 10-year warranty. The Whirlpool brand has been around for over 100 years and was founded back in 1908 by Lou Upton. What started as a manufacturing business that evolved into one of the first manufacturers of motorized washing machines with the Upton Machine Company, eventually merged into the home appliance giant Whirlpool Corporation in 1949. Since then, their list of accomplishments is extensive. They’ve had several company acquisitions, including Maytag Corporation in 2006, which has allowed them to continue to diversify their product offerings and better serve their customers. They are the first to mass produce many notable inventions, including automatic washing machines, electric dryers, and freeze-dried ice cream. Today, Whirlpool has positive public perceptions, especially among customers who use their water softeners. Lowe’s is their primary authorized retailer, and the company reports positive experiences working with Whirlpool and selling their products. In the unusual event of a customer complaint, the issue is often traced back to human error or problems with the installation, and not the equipment itself. Whirlpool is, of course, not the only brand in the water softener game. Here are a few of the notable competitors and how their most popular models compare to this manufacturer. Both Whirlpool and GE are household names when it comes to appliances, and their water softeners are very competitive in almost every way. For example, if we compare the GE 40,000 Grain Water Softener with the Whirlpool model, we find that they both use a two-in-one tank that holds both the resin and brine in one location. It has a low-salt alert system that will tell you when the brine compartment is running on empty and also incorporates a sediment removal filter that’s particularly effective in homes with well water. This unit is simple to install, and it pumps up to 9.5 gallons of water per minute. It’s best suited to families of five or less. It comes with a manufacturer warranty from GE for three years and retails for around $700. Compared to the $450 price point on the nearly identical Whirlpool model, this option is significantly more expensive without much added functionally. Fleck is considered to be a high-end manufacturer, and their Iron Pro 2 Combination Water Softener Iron Filter 80,000-Grain is an option that doesn’t have a comparable Whirlpool model. 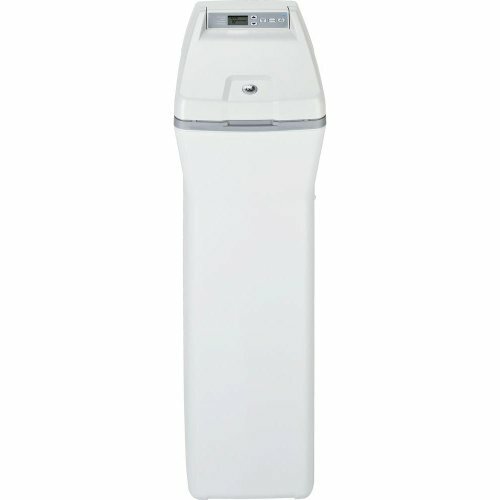 If you’re searching for a high-capacity water softener that can also remove iron, you’ll want to check out this model. It’s energy efficient, and not only softens your water but also purifies contaminants like rust, sulfur, and sediments. It comes with a five-year warranty on the head, and a ten-year warranty on the tank, which are some of the most generous programs out there. It retails for around $830, but you’ll also need to pay for a professional installation because the process is complex and hard to follow. If you’re in the market for a new water softener, you’ll be hard pressed to find better quality at a better price than what you’ll get with a Whirlpool model. Not only are they a reputable brand name that’s sold at stores like Lowes, but they are well-reviewed by customers as being effective, easy to use and install, and efficient. With a variety of models to choose from, and grain capacities to suit both small and large households alike, the chances are good that you’ll find an option that’s perfect for your needs by this manufacturer. Water softeners by Whirlpool are sold through a few different authorized retailers, including hardware stores like Ace and Lowes. Thanks to this, you can sometimes snag some serious savings if they are running a promotion, particularly in coordination with a holiday. Lowes has a weekly ad that includes coupons, and they can be as high as 25% off around holidays like Labor or Memorial Day. Also, they offer a year-round discount of 10% to military personnel and veterans, and you can use those savings towards your water softener purchase. Whirlpool also offers periodic customer rebates, particularly on energy-saving appliances. You can sign up to be notified of new specials on their website.